Most people associate moving with a place of residence, but a business moves too. Well, depending on the size of the business and the type of business, commercial relocation can be even more difficult rather than residential moves. Yes! The same rule is still applied. However, business owners often run into the same commercial relocation mistakes as homeowners. They key is knowing how to prepare. Once you have some basic steps of what it takes to get ready for a move, then it makes the entire process much less stressful. So, to make your move a bit less chaotic, here are some common mistakes that you need to avoid. Failing to plan ahead of time are the top common mistakes that most business owner do during commercial relocation process. Leaving it all to the last minute will push your stress levels through the roof and allow for costly mistakes to creep in. Well, due to the complexity of a commercial move, as a business owner, you should have a precise plan before you do the move. After all, a good way of organising your move is to have a business relocation checklist. And in your checklist, you may consider the things you need to do and the things you need to have as the relocation goes. It may be helpful for you to consider if you need to have a temporary business storage unit for your items or any possible move you need to consider. This will help you make sure that nothing gets missed or left behind. 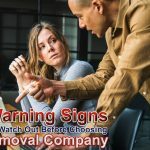 While your hires professional commercial moving company will do all the heavy lifting of your commercial relocation, don’t underestimate how complex and costly a commercial moved can be. Thus, better ask your office movers questions as soon as they arise. And create detailed moving budgets and checklist so you could exactly know what the commercial move entails in terms of cost, time and manpower. Before taking any commercial move, always make sure to back up your digital file. This will help you make sure that all your vital data are saved in case technical issues will arise before, during or after the move. Technically, when businesses move, it’s not just the chair and desks that need to transfer. Therefore, it is important for you to remember that you are running an entire business that has its own telephone services, internet, IT equipment and software that also need a change of location. With this, before taking your move, make sure to communicate with these vendors involve so they would know when and where you’ll be moving. Remember that a poor vendor management will slow down your business and no business owners want that, right? In today’s business trends, technology is a vital asset to any company. Thus, when you relocate your business from one place to another make sure that your computers and other digital electronic and IT equipment are properly handle by professionals. Stay organised and make sure to clearly label them and wrap with protected materials. Always let the professionals the unpacking to avoid damages of items. Time is money when it comes to business. Thus, by making a simple timeline and sticking to it, is important to your business. Therefore, make sure to set up your timeline together with your checklist in order to minimise disruption to your business during the move. Remember that time management is very important to every business to grow. So, if you are planning for a commercial relocation, make sure to begin thinking about the things that you need to do. In order to make your office move as successful as possible. You should remember that it is better to be over prepared than being under prepared. And since you have now the idea about the common mistakes that people make during commercial moves. You can now pay more attention to how you could avoid those common mistakes. Likewise, make sure to hire a professional and reliable moving company that could help your move stress-free and smooth. Looking for a relocation and removal service company? Bingo! Business Relocation Services is right here for you. Call us today for more details and we’ll be happy to provide you the services that you need. You may also check our website and discover our one of a kind relocation and removal service. Read our article: How to Choose the Right Place for Your Business by Commercial Removalists!